Pathologic tooth migration is a change in tooth position resulting from disruption of the forces that maintain teeth in a normal position in relation to their arch. The disruption of the equilibrium in tooth position may be caused by various etiologic factors. Loss of attachment apparatus along with a non periodontal related condition such as excess occlusal force, a progressive migration of tooth may take place. Mostly this migration can be associated with aesthetic damage of the smile line. To solve these issues, a combination of periodontal and orthodontic treatment is often needed. 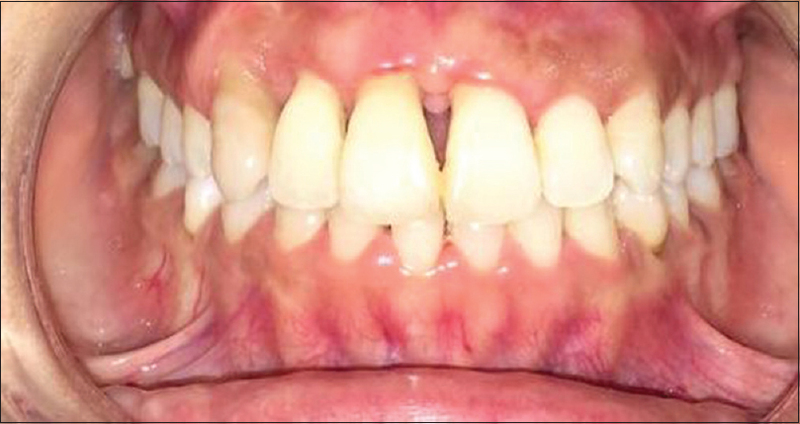 In this presentation a 23-year-old, systemically healthy, non-smoking female presented with the complaint of bleeding gums, mobility and increased space between upper and lower front teeth causing un-aesthetic appearance and low self esteem. She was treated with interdisciplinary approach of orthodontic and periodontal intervention. Improvement of facial esthetics contributed to the self-confidence of an adult periodontal patient with pathologic tooth migration. Follow up at 10 years post treatment confirmed the good choice of treatment planning and the tendency to improve the results over time. Periodontally compromised orthodontic patients can be satisfactorily treated, achieving correction of the malocclusion and a marked improvement in esthetics when an interdisciplinary approach is used. Periodontal bone loss appears to be a major agent in the etiology of PTM, along with occlusal changes caused by several factors. The pressure produced by inflammatory tissues within periodontal pocket is also considered important. When loss of attachment apparatus is combined with a nonperiodontal related condition such as excess occlusal force, a progressive migration of tooth may take place. Unfortunately, PTM can be associated with esthetic damage of the smile line, reducing a patient's self-esteem. To solve both issues, therefore, a combination of periodontic and orthodontic treatment is often needed. The aim of this work is to evaluate the effect of a combined orthodontic-periodontal nonsurgical and surgical therapy in the maintenance of a healthy periodontal status before and after the orthodontic treatment. It also emphasizes the importance of strict maintenance follow-up phase in such complex cases. Re-evaluation of the results of the treatment approach demonstrated stability in the short and long term. Reduce or keep the defects at the same level and fixed retention between teeth with bone loss. After several sessions of nonsurgical periodontal therapy comprising general scaling and complete root planning accompanied by recommendations concerning oral hygiene, re-evaluation of the periodontium showed statistically significant improvement in the periodontal parameters [Table 1]. Before periodontal surgical therapy, endodontic treatment was done in maxillary left central incisor as it was found to be nonvital with pulp testing. 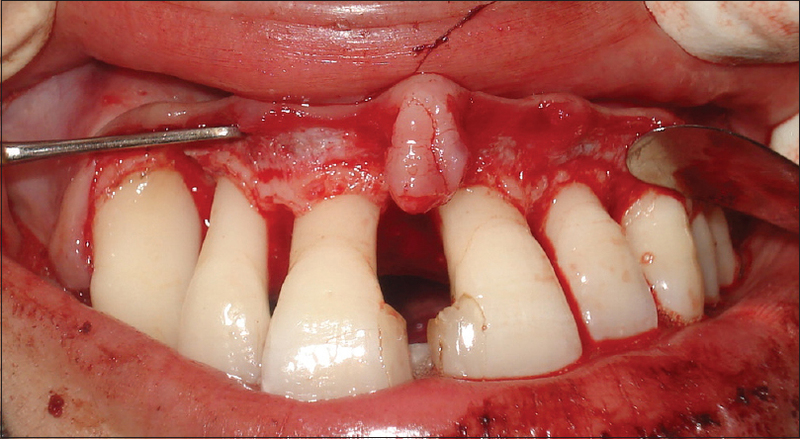 The modified papilla preservation surgical flap technique was selected when the interdental space was wider than 2 mm; the simplified papilla preservation surgical flap technique was performed where the space was >2 mm [Figure 3]. A full-thickness flap was elevated to allow adequate visualization at the treatment site [Figure 4]. 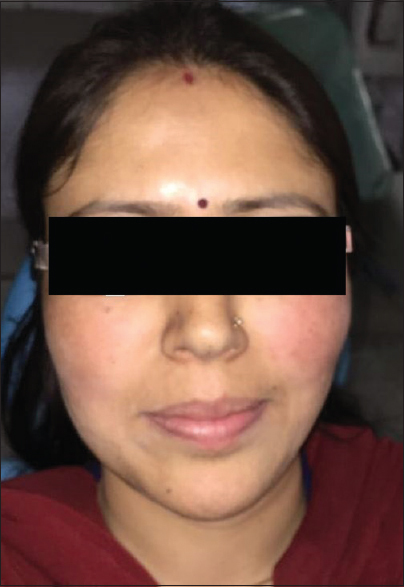 To reduce postoperative complications, including pain and swelling, the patient received antibiotic therapy (amoxicillin 1.5 g/day for 6 days) and rinsed twice a day for 15 days with chlorhexidine 0.2% as antiplaque, antigingivitis, and antiplaque agent. The sutures were removed after 7 days. The patient was enrolled in a recall system that included professional tooth cleaning and reinforcement of oral hygiene maintenance after periodontal treatment for 1 year [Figure 5]. Orthodontic treatment started 1 year after surgery. On stabilization of periodontal disease the patient underwent different types of movement according to the clinical need to realign the dental arch: intrusion and bodily movement that included movement away from the defect (tension side) and movement into the defect (pressure side). Orthodontic treatment was performed with the goal to obtain movement that would not impair the newly regenerated attachment. Straight-wire preadjusted brackets with thermoactive nickel archwire (3M MBT 0.22-inch victory system) manufactured by Victory 3M UNITEK were used to achieve well-controlled repositioning [Figure 6]. After debonding, the patient had a notably improved smile with no interference between the lower lip and the upper incisors, and she expressed genuine satisfaction. Posttreatment photographs confirm this esthetic improvement, with a more balanced profile and a harmonious face. The clinician selected an appropriate fixed retention device after active therapy. 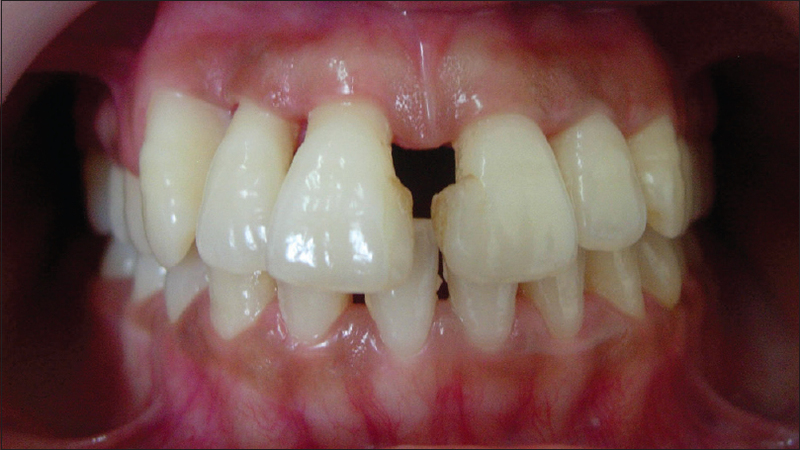 This long-term retention was used to prevent relapse, to decrease tooth mobility, and to improve chewing comfort. Following orthodontic treatment, functionally stable occlusion and improved periodontal parameters and esthetics were achieved [Figure 7]. The patient was put on meticulous oral hygiene program, and professional follow-up regimen was strictly practiced by orthodontist and periodontists at regular interval for 10 years till the present time. This approach ensured that shallower pocket depth upon periodontal probing, no adverse effect to the repaired periodontium, and stable bone levels were detected during the maintenance phase [Table 1] and [Figure 8], [Figure 9], [Figure 10], [Figure 11]. A general improvement in esthetic parameters as achieved with combined periodontal and orthodontic treatment was evident. Melsen et al. showed that orthodontic tooth movements on reduced periodontal tissue did not aggravate the loss of periodontal support but, on the contrary, encouraged bone apposition, the key to a good periodontal response.,, The periodontal study by Boyer et al. in 2011 showed an overall increase of bone level in the two patient groups: orthodontic and periodontal treatment or periodontal treatment alone. This tends to suggest that combination with orthodontic treatment in no way compromises the benefits of periodontal treatment. Similar findings were observed in the present case, where periodontal parameters were improved with periodontal nonsurgical and surgical therapy and later with orthodontic treatment. Meticulous oral hygiene practiced by patient and rigorous professional periodontal maintenance phase ensured stability of treatment result over long period of time. Periodontally compromised orthodontic patients can be satisfactorily treated, achieving correction of the malocclusion and a marked improvement in esthetics, when an interdisciplinary approach is used. There are two delicate fundamental questions to be addressed in the orthodontic phase: the correct and careful application of forces and the monitoring of oral hygiene. In the postorthodontic phase, permanent retention was established. The combination of periodontal-orthodontic therapy can allow the achievement of satisfactory outcomes from esthetic, occlusal, and functional standpoints if physiologic forces are used, periodontal inflammation is controlled, and meticulous oral hygiene is maintained throughout active therapy. Improvement of facial esthetics contributed to the self-confidence of an adult periodontal patient with PTM follow-up at 10-year posttreatment confirmed the good choice of treatment planning and the tendency to improve the results over time. Chasens AI. Periodontal disease, pathologic tooth migration and adult orthodontics. N Y J Dent 1979;49:40-3. Towfighi PP, Brunsvold MA, Storey AT, Arnold RM, Willman DE, McMahan CA. 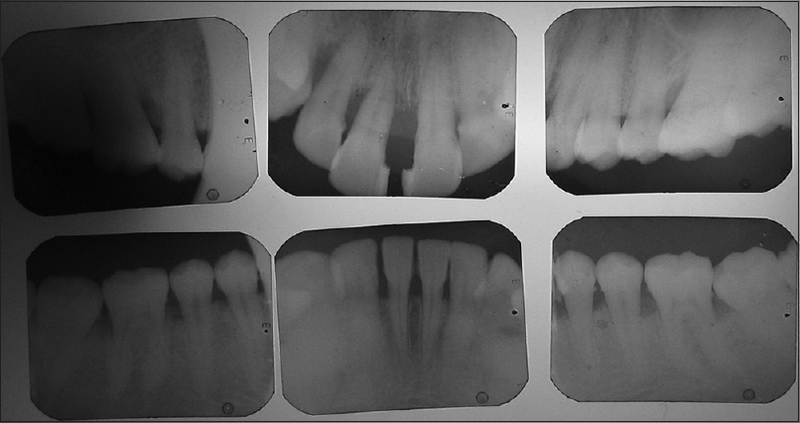 Pathologic migration of anterior teeth in patients with moderate to severe periodontitis. J Periodontol 1997;68:967-72. Brunsvold MA. Pathologic tooth migration. J Periodontol 2005;76:859-66. Cirelli JA, Cirelli CC, Holzhausen M, Martins LP, Brandão CH. Combined periodontal, orthodontic, and restorative treatment of pathologic migration of anterior teeth: A case report. Int J Periodontics Restorative Dent 2006;26:501-6. Peter S. Essentials of Preventive Community Dentistry. 6th Ed. 2015:118-19. McKiernan EX, McKiernan F, Jones ML. Psychological profiles and motives of adults seeking orthodontic treatment. Int J Adult Orthodon Orthognath Surg 1992;7:187-98. Serio FG, Hawley CE. 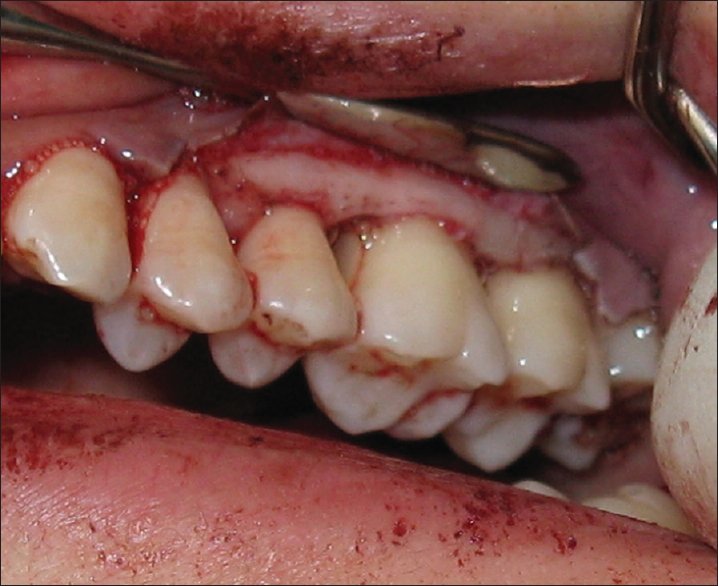 Periodontal trauma and mobility. Diagnosis and treatment planning. Dent Clin North Am 1999;43:37-44. 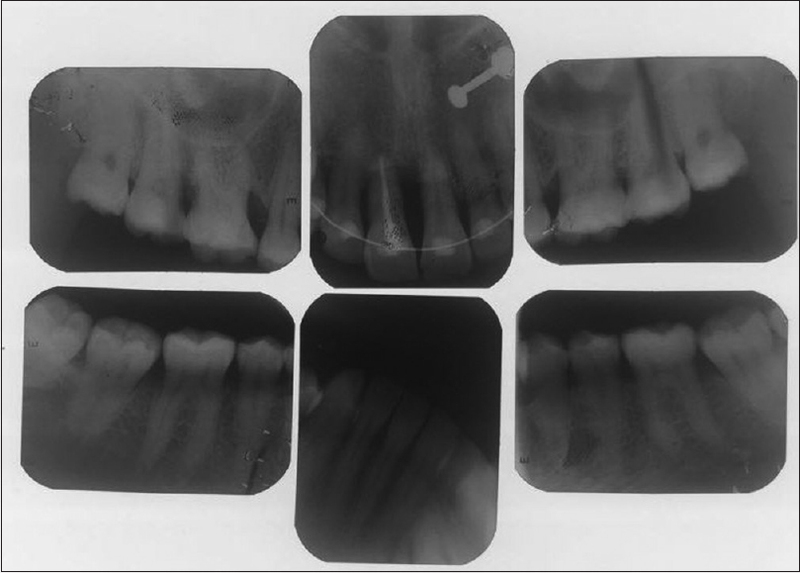 Rohatgi S, Narula SC, Sharma RK, Tewari S, Bansal P. A study on clinical attachment loss and gingival inflammation as etiologic factors in pathologic tooth migration. Niger J Clin Pract 2011;14:449-53. Feng X, Oba T, Oba Y, Moriyama K. An interdisciplinary approach for improved functional and esthetic results in a periodontally compromised adult patient. Angle Orthod 2005;75:1061-70. Ong MA, Wang HL, Smith FN. Interrelationship between periodontics and adult orthodontics. J Clin Periodontol 1998;25:271-7. Derton N, Derton R, Perini A, Gracco A, Fornaciari PA. 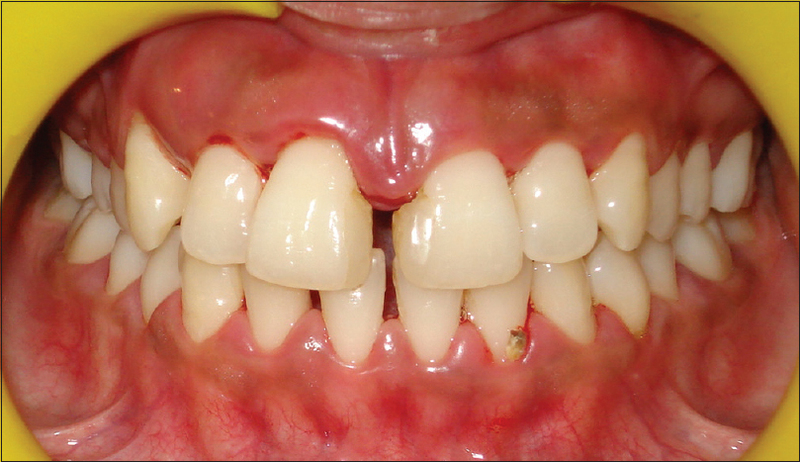 Orthodontic treatment in periodontal patients: A case report with 7 years follow-up. Int Orthod 2011;9:92-109. Tian C, Li Xu, Jie Shi, Yanheng Z. 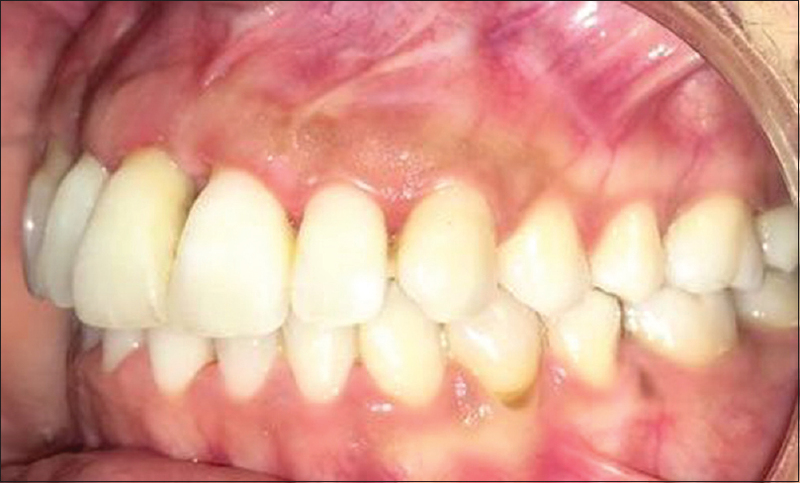 Combined orthodontic-periodontal treatment in periodontal patients with anteriorly displaced incisors. Am J Orthod Dentofacial Orthop 2015;148:805-13. Diedrich PR. Orthodontic procedures improving periodontal prognosis. Dent Clin North Am 1996;40:875-87. Boyd RL, Leggott PJ, Quinn RS, Eakle WS, Chambers D. Periodontal implications of orthodontic treatment in adults with reduced or normal periodontal tissues versus those of adolescents. Am J Orthod Dentofacial Orthop 1989;96:191-8. Kim YI, Kim MJ, Choi JI, Park SB. 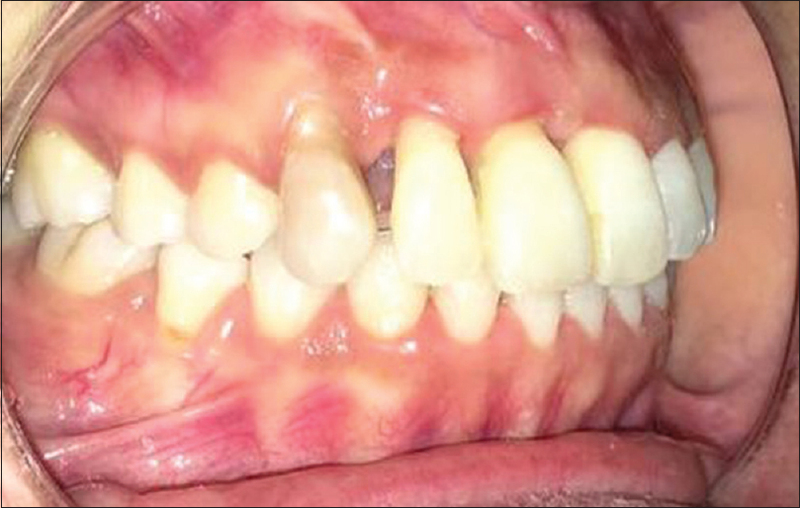 A multidisciplinary approach for the management of pathologic tooth migration in a patient with moderately advanced periodontal disease. Int J Periodontics Restorative Dent 2012;32:225-30. Sadowsky C, BeGole EA. Long-term effects of orthodontic treatment on periodontal health. Am J Orthod 1981;80:156-72. Polson AM, Reed BE. Long-term effect of orthodontic treatment on crestal alveolar bone levels. J Periodontol 1984;55:28-34. Melsen B. Tissue reaction following application of extrusive and intrusive forces to teeth in adult monkeys. Am J Orthod 1986;89:469-75. Laporte L. Maintaining periodontal health during adult orthodontic treatment. Rev Orthop Dento-Faciale 2009;43:27-42. Melsen B, Agerbaek N, Eriksen J, Terp S. New attachment through periodontal treatment and orthodontic intrusion. Am J Orthod Dentofacial Orthop 1988;94:104-16. Melsen B. Biological reaction of alveolar bone to orthodontic tooth movement. Angle Orthod 1999;69:151-8. Boyer S, Fontanel F, Danan M, Olivier M, Bouter D, Brion M. Severe periodontitis and orthodontics: Evaluation of long-term results. Int Orthod 2011;9:259-73.